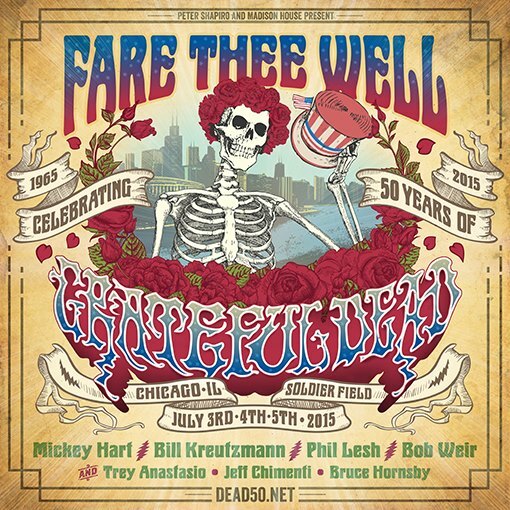 If you’re like us, you were wondering just how many mail orders were received for Fare Thee Well, which will bring together Grateful Dead members Bob Weir, Phil Lesh, Mickey Hart and Bill Kreutzmann with Trey Anastasio, Jeff Chimenti and Bruce Hornsby for three shows in Chicago over the Fourth of July Weekend. The answer is almost unbelievable, as a a note on the event’s website mentions that 60,000+ envelopes were received so far by GDTSTOO, which is handling mail order fulfillment. Fare Thee Well co-promoter Peter Shapiro’s Relix Magazine reveals that the 60,000+ envelopes are “requesting an estimated 350,000+ tickets for the three nights.” We knew these shows would be popular with fans, but not to that level. In case you missed it, check out the highlights of Hornsby’s recent chat about Fare Thee Well.